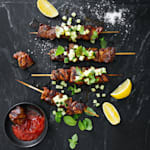 They are as delicate as they are elegant. 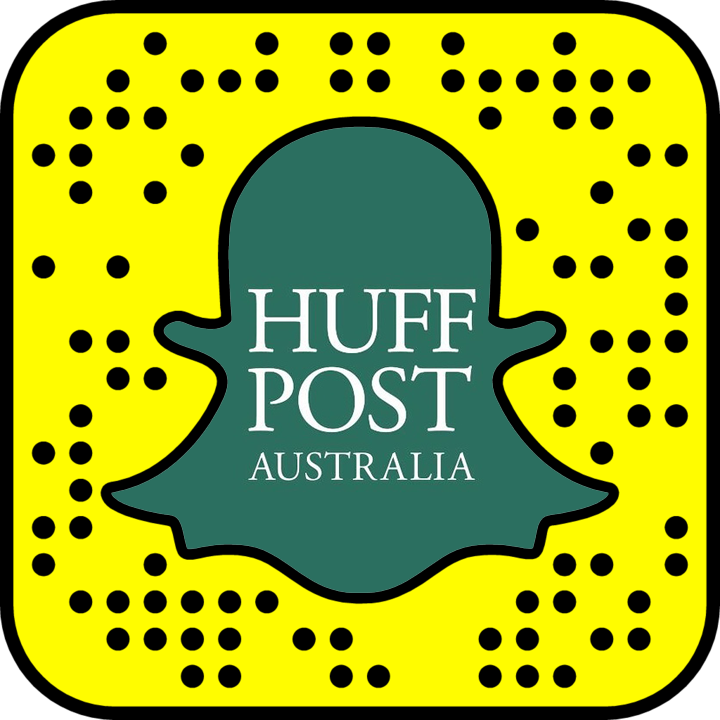 "At given periods, Lake Bogoria can house up to 1 million individuals." An incessant honking permeates the warm, thick, sulphur-smelling air. Monotone calls echo across the lake while thousands of lesser flamingos create a vibrant sea of pink in the alkaline waters of Bogoria. Millions of years ago, in the wake of volcanic activity that tore up a large part of Africa, beautiful depressions, highlands and valleys were created, forming what has become the picturesque Rift Valley today. This undulating terrain runs from Jordan River to Mozambique, and is so prominent that it's visible from space. 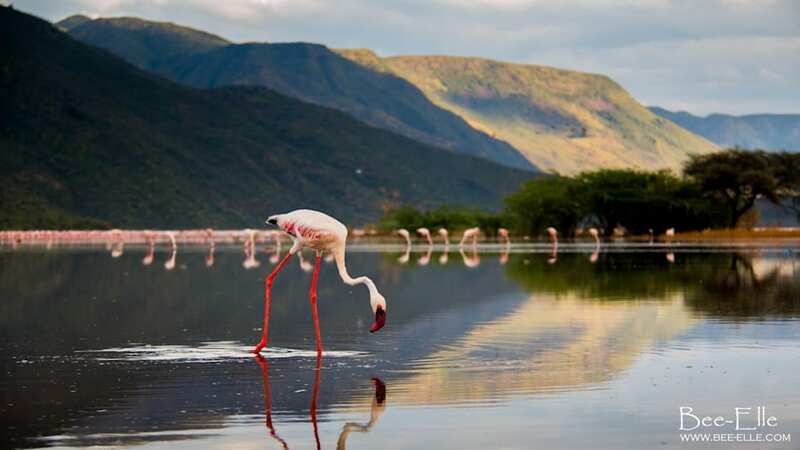 During the creation of this dramatic landscape, a chain of alkaline lakes was formed and has since become home to 75 percent of the world's population of the lesser flamingo. 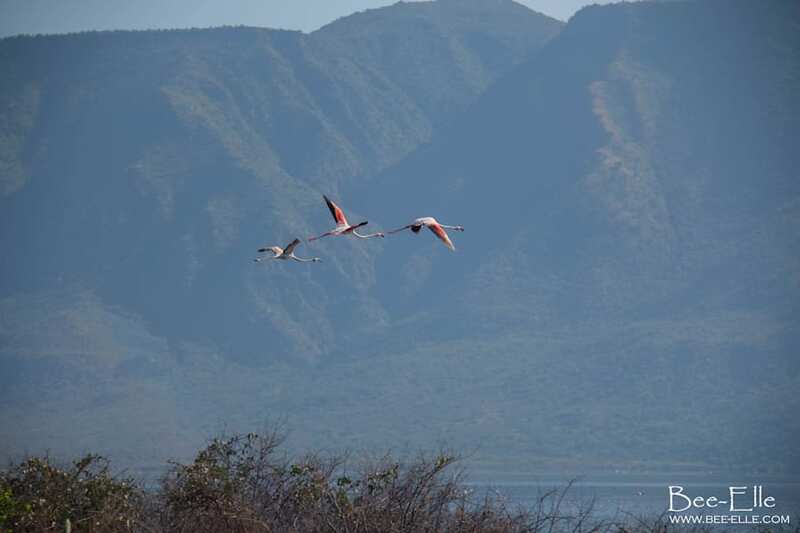 Greater flamingos take flight over Lake Bogoria, which is cradled by the Ngendele Escarpment. While these lakes make for some of the harshest conditions on the planet -- scorching temperatures and highly caustic properties -- these birds thrive in such environments. As a consequence, these lakes have become their safe havens: places to live, places to breed. At given periods, Lake Bogoria can house up to 1 million individuals. When it's time to breed, they'll fly south to Lake Natron in Tanzania,Namibia's Etosha Pan or Botswana's Sua Pan of Makgadikgadi. With approximately 2.2-3.2 million lesser flamingoes in the world, they exist in abundance, yet their existence is threatened. Delicate and elegant, their long necks bend and curve with grace each time they reach down to the water's surface to feed. Their heads move from side to side in a semi-circle fashion, using the filters in their beak to sift out their main source of food, a type of cyanobacteria called Arthrospira platensis, or as it's more commonly known, blue-green algae. 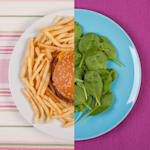 The unmistakable pink hue of the bird comes from the coloured pigments of carotenoids in blue-green algae, which protects the chlorophyll in plants from sun damage. These algae can only bloom within water with a very specific range of water chemistry. A slight rise in water levels will significantly disrupt the production of the flamingo's food source, causing it to crash. As a result, in the dead of the night, the flocks will move on to one of the other lakes along the chain. Within Kenya, they'll move to Elmenteita, Magadi, Nakuru and Naivasha or sometimes Turkana. 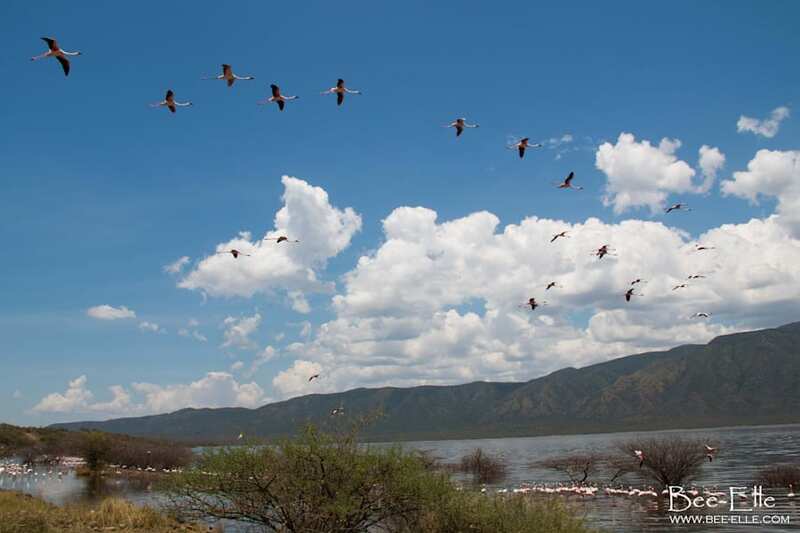 When water levels change, the lesser flamingo's food supply becomes low and flocks will move between various soda lakes along the Rift Valley. 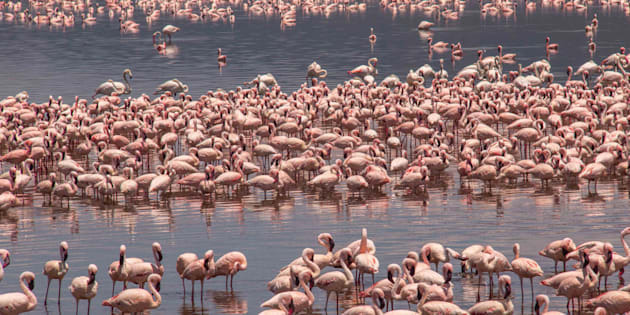 Mysterious mass die-offs of flamingos in the Eastern Rift Valley lakes have occurred since the 1990s and have left researchers searching for answers for decades. Hundreds of thousands of flamingoes have perished in these die-offs, some dying within a matter of days and occurring in flocks in their tens of thousands. Since the 1990s, mass die-offs have occurred in the Rift Valley lakes, killing up to 40,000 birds within a matter of days. In 2008, 30,000 flamingoes died at Lake Bogoria within one week. In 2006, 30,000 birds were found dead at Nakuru. 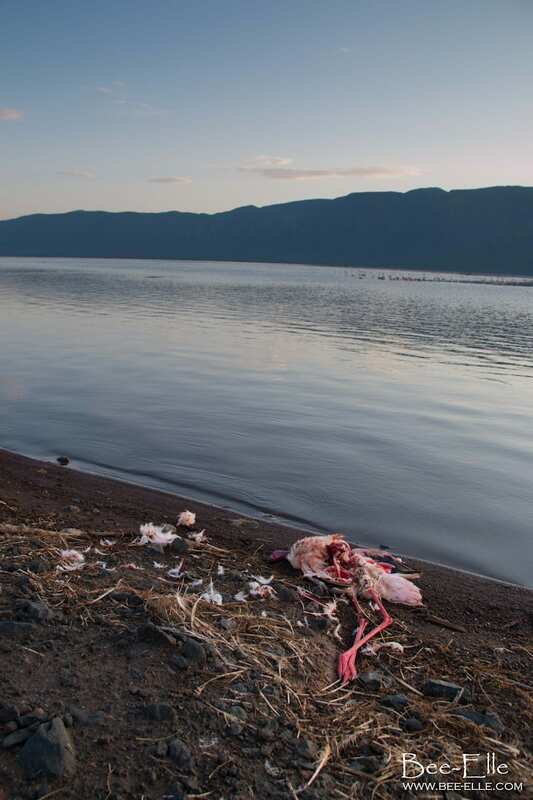 In 2004, 43,800 birds perished at Lake Manyara. In 1993, approximately 40,000 birds died within a three-month window. 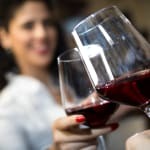 Many more of these events have been recorded since 1991. 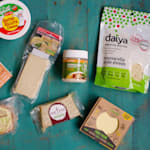 The theories as to why are varied: some point to pollution from pesticides and heavy metal contaminants, some to disease including avian influenza and cholera, and some due to bacterial toxicity caused by other forms of cyanobacteria. 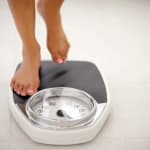 There's every chance that many of the deaths could be tied to all of the above, however irregular monitoring has made it difficult to conclude much. Irregular monitoring and few studies have made it difficult to ascertain the reason for the mass die-offs. Further to these threats to the system, a few years ago these birds narrowly escaped a similarly grave situation that would have been created by a commercial development. 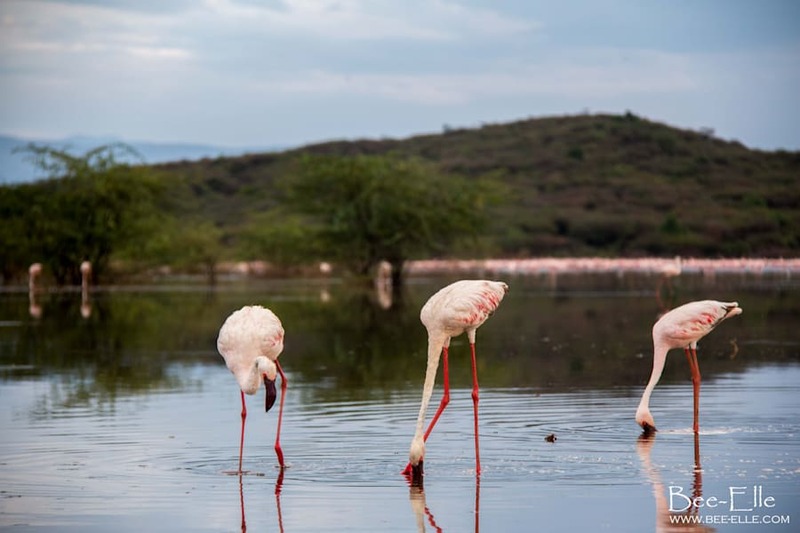 Tanzania was set to develop a controversial $500 million soda ash extraction plant in Lake Natron, the main breeding ground for three quarters of the world's lesser flamingo population. After intensive lobbying from conservationists and communities, the plan was put on hold. It could, however, at any given moment become reactivated, creating yet another shroud of uncertainty over the future of Africa's iconic bird. 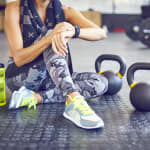 As these lakes are high in sodium carbonate, soda ash is commercially mined to create various items including glass, detergents and chemicals. 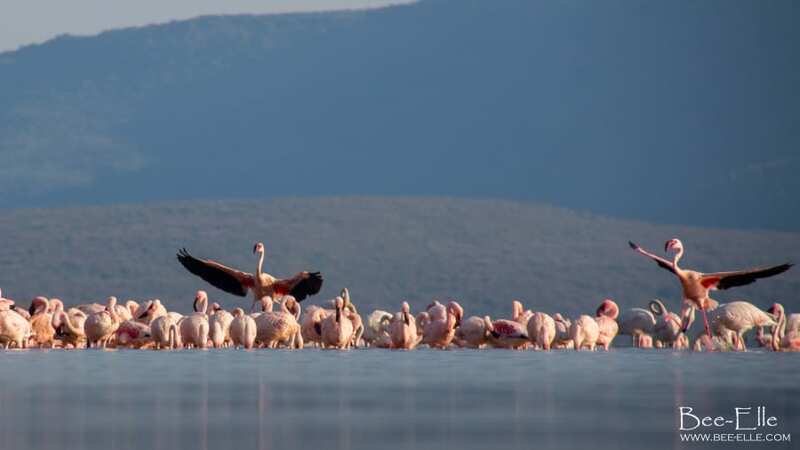 While the TATA Chemicals soda ash factory in Kenya's Lake Magadi has created plenty of jobs and contributed towards economic development for over 100 years, populations of the lesser flamingo at this lake have reduced to extreme lows, and due to the pollution and damage to the environment, they have not bred there for the past 50 years. Wastewaters from industrial effluent, sewerage and fertiliser run-off from neighbouring communities continue to damage the quality of Magadi's waters. If trends continue, it's estimated the lesser flamingo will become extinct in 100 years. These sensitive birds have been through a lot. 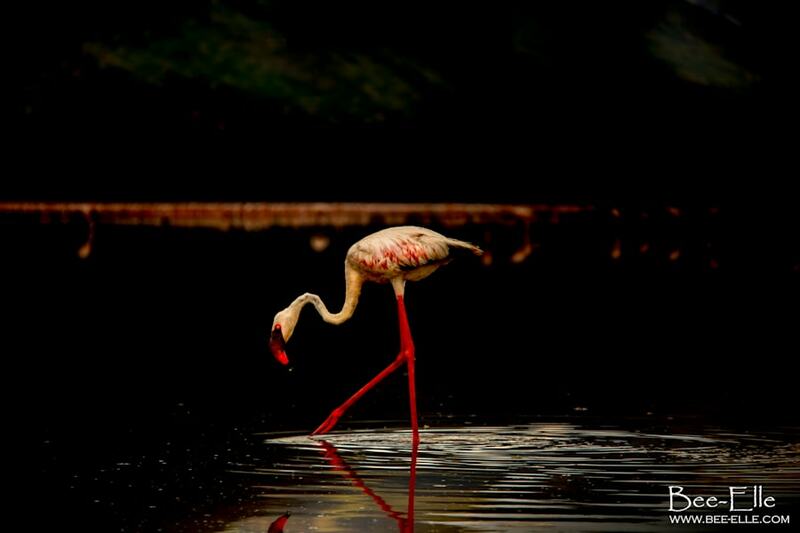 While a mass die-off has not occurred for nearly 10 years, and the soda ash extraction plant has been temporarily shelved, the lesser flamingo continues to decline in population. 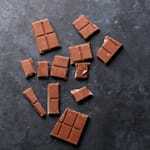 It's been suggested by WWF that if trends continue, they only have 100 years left. 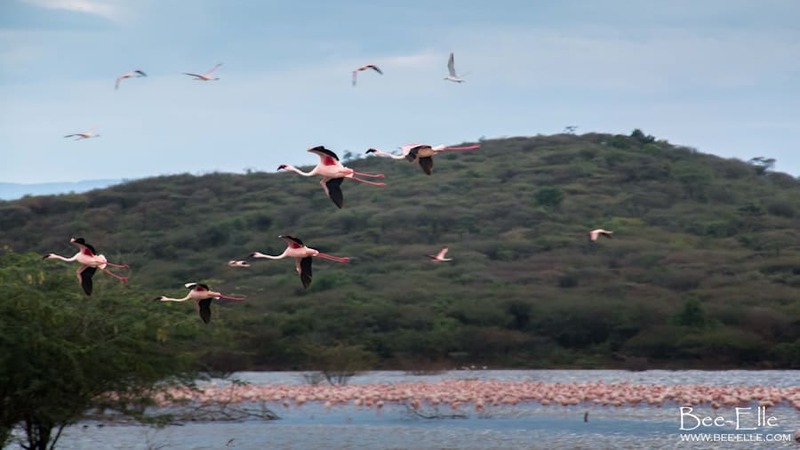 As an international action plan for the lesser flamingo has recommended, these birds need to continue being monitored closely and the lakes should be become officially protected sites. Additionally, appropriate legislation needs to be created to reduce pollution from heavy metals and industrial chemicals and to minimise other disturbances to this fragile bird's habitat. If not, there'll be no question as to what will happen -- the stars of the world's greatest bird spectacle, the only bird that can turn an entire lake into a beautiful pink, may soon disappear within a century. Elephants Are Smart, But Are Humans Smart Enough To Save Them?